I decided to design an A440 reference oscillator out of an ATTINY microcontroller based on a request from the Synth-DIY group. 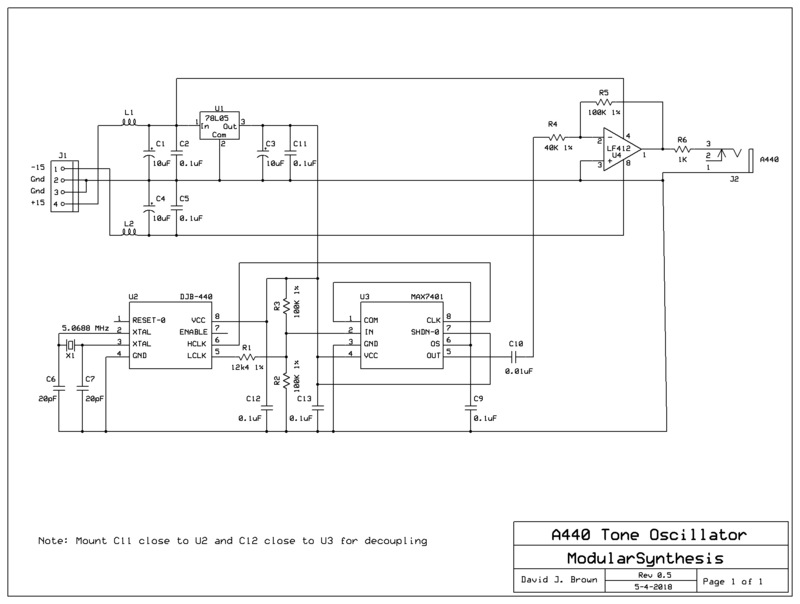 I already have an A440 reference oscillator in my DJB-002 module built upon a Clare M-991 Call Progress Tone Generator. I used an Atmel ATTINY45 with a 5.0688 MHz crystal with a software divide by 11,520 to produce 440 Hz as shown by the top oscilloscope waveform. I used one input as an enable pin with an internal pullup. When this input is low the oscillator output will remain low (and will not truncate the high cycle). I used one of the 8 bit timers to generate a 43,696 Hz Hz square wave output to clock a Maxim Max7401 8th order switched capacitor filter. 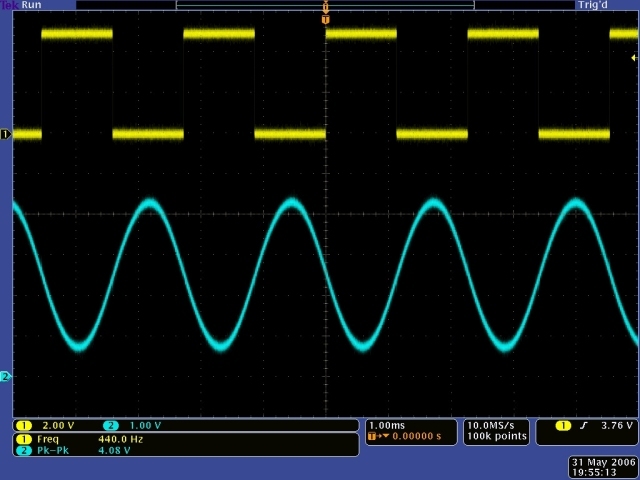 This filter generates a very nice sine wave output as shown by the bottom scope trace. Since both parts are running at +5 volts, the input to the filter is rail-to-rail which increases total harmonic distortion in the filter. This can be reduced by attenuating the output of the ATTINY45 to 4 volts peak-to-peak centered at 2.5 volts. I've used attenuation with both AC and DC coupling as well as no attenuation as shown in the schematic. All three worked equally well on a small sample size. Here is the oscillator and 8th order low pass filter with the three resistor attenuation circuit. Very few parts are used. An amplifier is required to increase the gain back to 10 volts peak-to-peak. I did a one-time group purchase of parts for Synth-DIY. The Maxim parts are not sold through distribution and must be purchased direct in small volumes. I am not planning another purchase from Maxim. 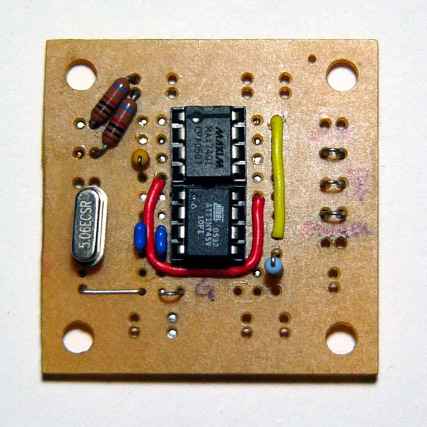 I still have ATTINY45 parts, so contact me if interested. They produce a square wave output and a simple op-amp two pole filter generates a reasonable sine wave. I made a special version for William Hall that will operate at 440.0 Hz or 440.5 Hz selected by the enable pin. He is using it in his Tellun 867 module.